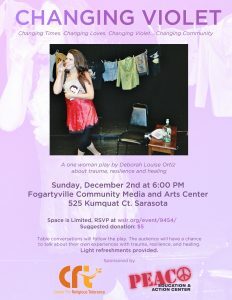 On Sunday, December 2nd, “Changing Violet” will be presented at Fogartyville Community Media and Arts Center at 6 PM. Deborah Louise Ortiz, writer, actress and author of “Changing Violet”, spoke to the Center for Religious Tolerance (CRT) about the play and how it has influenced her life. Ortiz describes herself as a “mother, a wife, an advocate for better mental health practices and removing the stigma attached to mental illness”. The play, Changing Violet, is a one-woman show about Deborah’s life from childhood to becoming a woman. “It’s a show that deals with unresolved childhood trauma and how that set the tone for my life”, Ortiz explains. The search for help for her own trauma and the dark secrets she lived with inspired the play. “I felt inspired to write about my truth in hopes to remove the stigma I felt and most importantly, help other women and men face their trauma and know that there is hope”. Deborah also told us about how it allowed her to create something she can perform with real substance. Through this play, she has learned that she is stronger than she ever could have imagined. She added that she has nothing to be ashamed of and that she can turn a horrible thing into something good. Of course, besides all the important topics the play addresses, it focuses on sending out one important message: that we can not allow the demons we deal with to wreak havoc on our lives. The play wants to remind people that no matter how hard life gets and how many problems one has, there’s hope and help available to “come through a dark place and emerge stronger”. Changing Violet has been performed in New York City, Texas and Florida. With showings on black box stages in New York, including the Producers Club and Shetler Studios. It’s also been presented for Peace for Tarpon (a grassroots effort building a trauma-informed community in Tarpon Springs, FL), and for the US Army regarding their sexual assault awareness month. “It is a very hard show for me to do but during the Q and A after every show, the impact it has makes it all worthwhile”, Ortiz reflected. Following the show’s tradition, after the presentation, there will be a Q and A along with table conversations and light refreshments. The Center for Religious Tolerance and the Peace Education and Action Center hopes that the space encourages everyone to open up and have meaningful conversations regarding trauma and how to rise above it. In the Arab town of Furedis in Israel-Palestine, I had the pleasure of re-connecting with a long time friend and amazing woman, Iptisam Mahameed. She is an Arab Israeli who is actively involved in women’s right’s issues, peace building, and local village politics. She also works with Jewish and Muslim women to build understanding and connection. It’s a common sight to see Iptisam closely woven into the fabric of her community as a local mover and shaker. One thing that is not so common to see in Furedis are Israeli Jews – the towns in the area are pretty strongly segregated. On this particular day, however, Jewish Israelis were wandering through the markets of Furedis, and Iptisam’s role was expanded a bit out of the norm. On this Iptisam was meeting with a group of Israeli Jews lovely autumn day in Furedis from Tel Aviv to give a cooking lesson. Somehow, “Ipti” had met a chef from Tel Aviv and invited him and a group of his “foodie” restaurant clients to Furedis for a food extravaganza! This was the first time most if not all of these Israelis had been in an Arab village, let alone shopped in an Arab market. Later, at Iptisam’s home, they watched closely, with concentration and growing interest as Iptisam put together an incredible feast. Tasks like chopping and stirring were doled out freely. Gradually, everyone got involved and in anticipation of the meal to come stomachs began to growl, and mouths watered. Here were Muslims and Jews meeting and mingling, getting to know each other and most of all, absolutely bonding over the shared meal to come. Iptisam cooked an incredible fish stew in an outdoor propane fueled wok-like pot – fish heads bobbing in the fragrant broth. The table was absolutely loaded with authentic home-style Arab food of every sort. It was a sight to see Ipti and the chef, heads together and speaking passionately in the shared language of cooking and food. This was a fascinating and delicious experience on so many levels. We can connect over art, music, language, children, but in my opinion, food is right up there at the top of the list of ways we can be together and one that should happen more often! Just the other day I was watching the movie “Home”, which describes the impact we humans have made on our home; planet Earth. It made me cry, to see how we have in so many ways unthinkingly disrupted the balance of the natural world. When I am faced with overwhelming destruction, wrong-doing, or just ignorance my first reaction is to freeze, hide, or simply curl up and go to sleep. It’s too much, the damage is too extensive, and the problem is too big. As I allow myself to consider what impact I, one person out of 7 billion could possibly make to change or alter the course of what appears to be inevitable, whether it’s regarding nature, gun violence, the poor, or peace in our world, I remember one thing. We are all interconnected. Though we may believe we are isolated, there is no act or non-action that does not in some way impact another. In science, we know that the motion of one atom, transfers energy to another and is passed along in an ever widening radius; open a perfume bottle in an auditorium and eventually that perfume will permeate the entire hall. Even though our noses may not be instruments precise enough to discern the perfume in the back of the hall, we know, due to the nature of air that the fragrance has made the journey to the back row. In the same way we all impact the world around us, when we choose acts of peace, kindness, and love over those of hate and despair we make a difference. These differences may not be discernible at great distances, and the repercussions may be subtle but the impact is real. So let’s unwind from the fetal position and try to save the world one loving act at a time.